[138 Pages Report] Ceramic Substrates Market size was valued at USD 5.97 Billion in 2016 and is projected to reach USD 8.68 Billion by 2022, at a CAGR of 6.44% during the forecast period. The base year considered for the study is 2016, and the forecast period is from 2017 to 2022. Both, top-down and bottom-up approaches were utilized to estimate and project the size of the ceramic substrates market. The size of the ceramic substrates market was calculated, and weightages were assigned to various market segments. This was performed on the basis of extensive primary interviews and secondary research based on the information available on websites of various associations, such as the American Ceramic Society, European Ceramic Society, British Ceramic Confederation, Contemporary Ceramic Studios Association, Morbi Ceramics Associations, and Ceramic Society of Japan. Primary research included extensive interviews with key personnel, such as CEOs, VPs, directors, and executives. After arriving at the overall market size, the total market was split into several segments and subsegments. The data triangulation and market breakdown procedures were employed to complete the overall market engineering process and arrive at the exact statistics for all segments and subsegments. The breakdown of profiles of primary respondents is depicted in the figure below. 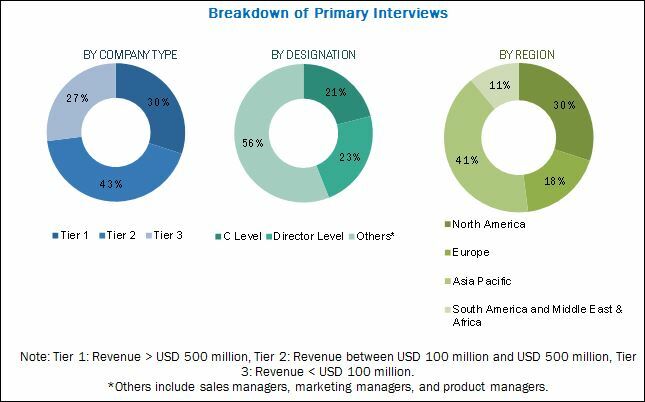 The ecosystem of the ceramic substrates market comprises manufacturers of ceramic substrates, such as Kyocera (Japan), Murata Manufacturing (Japan), CoorsTek (US), Ceram Tec (Germany), Maruwa (Japan), Tong Hsing Electronic Industries (Taiwan), LEATEC Fine Ceramics (Taiwan), Nikko Company (Japan), KOA Corporation (Japan), and Yokowo (Japan); and end user industries, such as ETI (Slovenia), SST Sensing (Scotland), Emerson Electric (US), B/E Aerospace (US), and Siemens (Germany). The ceramic substrates market is projected to grow from an estimated USD 6.35 Billion in 2017 to USD 8.68 Billion by 2022, at a CAGR of 6.44% during the forecast period. The market is mainly driven due to the characteristic properties of ceramic substrates, such as high-temperature stability, corrosion-resistance, lightweight, low thermal expansion, and a variety of electrical properties ranging from semiconductors to highly conductive materials. Owing to these properties, ceramic substrates are used in a wide range of end-use industries, such as consumer electronics, automotive, industrial, and telecom. The ceramic substrates market has been segmented on the basis of product type, end-use industry, and region. On the basis of product type, the alumina segment leads the ceramic substrates market due to the suitability of alumina substrate in a number of application areas as well as its low cost as compared to other ceramic substrates. On the basis of end-use industry, the ceramic substrates market has been classified into consumer electronics, automotive, telecom, industrial, military & avionics, medical, and space & satellite. The automotive segment is projected to grow at the highest CAGR between 2017 and 2022. High reliability; excellent thermal, mechanical, and dimensional stability; and high thermal conductivity make ceramic substrates a suitable choice for automotive manufacturers. Based on region, the ceramic substrates market has been segmented into North America, Europe, Asia Pacific, South America, and the Middle East & Africa. Asia Pacific is the largest market for ceramic substrates and is expected to continue leading the market till 2022. Asia Pacific is also projected to be the fastest-growing market for ceramic substrates, driven by the high demand for electronic products from the region’s developing countries. The growth of the ceramic substrates market in Asia Pacific is mainly driven by China and Japan, which together account for the largest share of the market in this region. The ceramic substrates market in China has grown exceptionally and is expected to witness further growth in the near future due to the continuous transfer of worldwide ceramic substrates production facilities in this country. The requirement of significant R&D expenses in the ceramic substrates market due to ongoing developments and modifications in manufacturing technologies makes the entry of new players difficult. The major barriers to the market growth include the higher cost of ceramic substrates products as compared to metals and alloys and issues of reparability and recyclability of ceramic materials used in different applications due to their high durability. 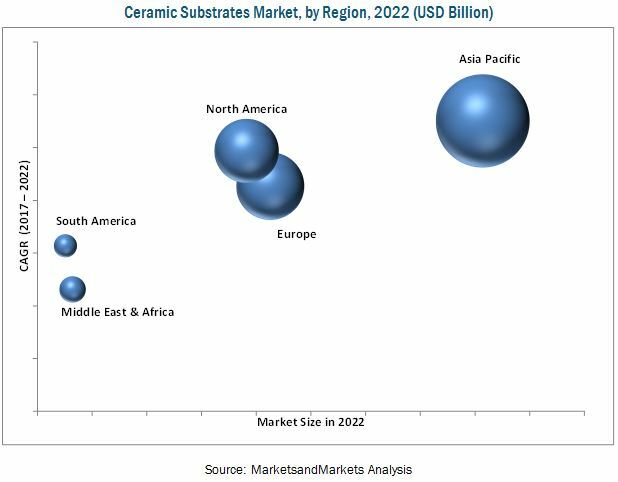 Acquisitions and expansions were the major developmental strategies adopted by key players operating in the ceramic substrates market between 2013 and July 2017. Companies such as Kyocera (Japan), CoorsTek (US), and CeramTec (Germany) have adopted these strategies to enhance their product offerings and customer base as well as gain a competitive edge over their peers in the market. These companies are also focused on investing in research & development activities to introduce new and cost-effective materials to keep up with the changing consumer needs.